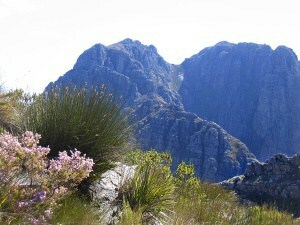 Cape Winelands Walk is a 4, 5 or 7 day self-guided walking/hiking holiday offered by Trails and Travel. 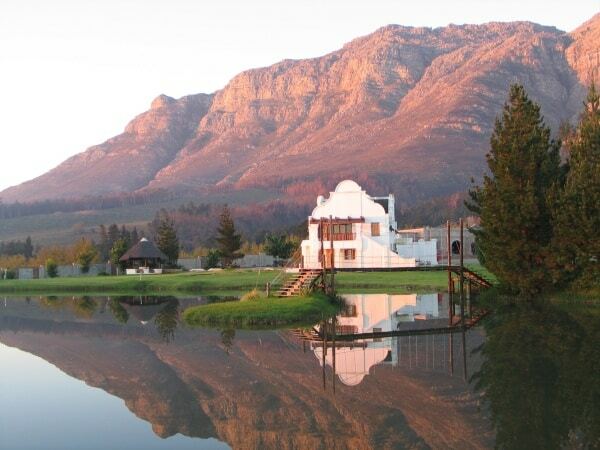 It is an opportunity to discover the area between Somerset West and Stellenbosch. 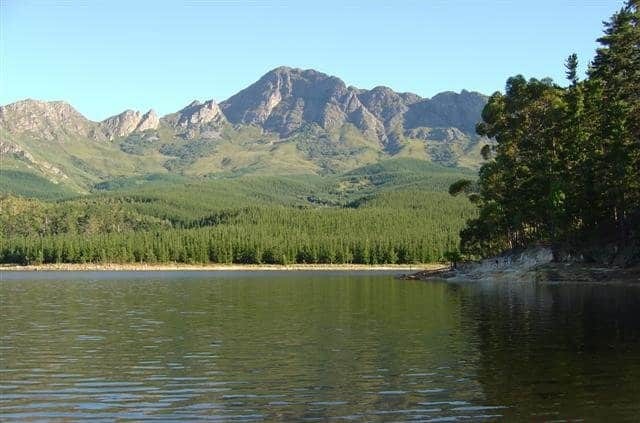 This is one of the most beautiful parts of South Africa with distinctive and spectacular countryside. The Cape Winelands region is regarded as one of the most beautiful parts of South Africa. Of this the area between Somerset West and Stellenbosch is the jewel in the crown. 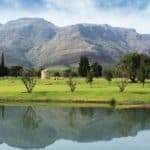 The Cape Winelands Walk offers an opportunity to experience the splendour of this distinctive and spectacular countryside first-hand. The walk covers a distance of some 50 km – 5 days. 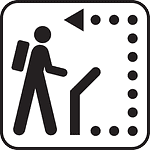 A longer option of the trail is also available. Your journey will take you through pristine “fynbos” – the distinctive feature of the Cape Floral Region. It is the smallest but richest of the world’s 6 floral kingdoms with no less than 9,000 species. You will walk along private and secure footpaths that wend their way through some of South Africa’s most esteemed wine estates – through an undulating and spectacularly varied countryside that will provide vista upon breathtaking vista. Security Most of the trip is over private property with security gates. Day 1: Arrival in Somerset West for overnight. Day 2: The walking trip starts in the remarkable fynbos-rich Helderberg Nature Reserve – abundant with a dazzling variety of birdlife – on the outskirts of the town of Somerset West. This includes a lecture on what nature has to offer over the next 3 days. From there we will follow our route through the vineyards of the stately Lourensford Wine Estate, to end our day’s adventure on the magnificent Vergelegen Wine Estate – which started out as VOC Governor Willem Adriaan van der Stel’s folly, more than 300 years ago. Distance 10 km – Whole Day. Day 4: Waterford Estate Porcupine Trail (5 km- 3 hours). 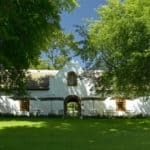 The property is situated on the slopes of the beautiful Helderberg Mountain in the Stellenbosch region – the undisputed wine capital of South Africa. The Estate has chosen to use only half of the total land for the planting of vines, in order to preserve and maintain the natural flora and fauna of the beautiful Blaauwklippen (blue stone) valley. 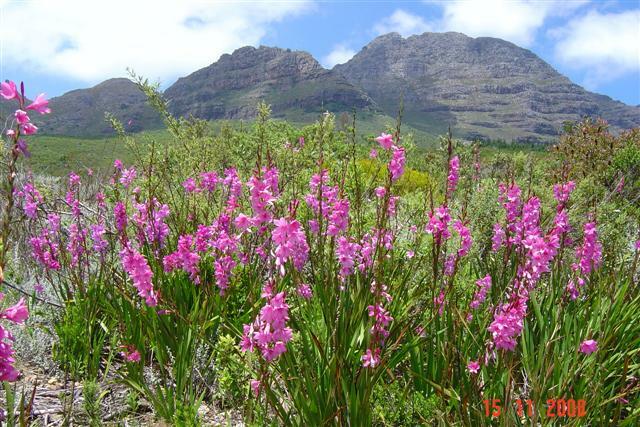 The Cape is home to the largest and most spectacular concentration of flowers and plants found anywhere on earth. From Waterford to Dornier Estate and Vriesenhof in the Blaauwklippen valley. Distance for the day 12 km. 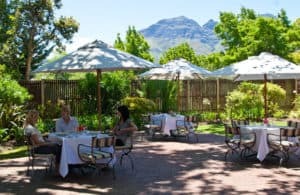 After Cape Town, Stellenbosch is South Africa’s oldest settlement, and steeped in a fascinating and convoluted history. The final day’s walk is through the proud old university town with its countless splendidly preserved buildings. This is a walk through history. Distance 10 km. 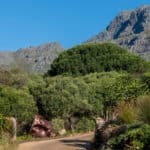 Day 2: The walking trip starts in the remarkable fynbos-rich Helderberg Nature Reserve – abundant with a dazzling variety of birdlife – on the outskirts of the town of Somerset West. This includes a lecture on what nature has to offer over the next 4 days. From there we will follow our route through the vineyards of the stately Lourensford Wine Estate, to end our day’s adventure on the magnificent Vergelegen Wine Estate – which started out as VOC Governor Willem Adriaan van der Stel’s folly, more than 300 years ago. Distance 10 km – Whole Day. Day 7: After Cape Town, Stellenbosch is South Africa’s oldest settlement and steeped in a fascinating and convoluted history. The final day’s walk is through the proud old university town with its countless splendidly preserved buildings. This is a walk through history. Distance 10 km. Departure or extra night, if requested. The rate for the Standard option is R8 350 per person sharing. For a group of 4, with 2 people per room, the rate is R7 500 per person. It will be 4 star standard. The rate for single accommodation or an extra night (night 4) in Stellenbosch or more than four people per group, available on request. The Superior package offers a combination of superior 4 star rooms and 5 star, depending on availability. The rate will be quoted on request, based on hotels selected. During low season (May-September) the holiday may be available at a reduced rate. A minimum of 2 people per group. The rate is linked to the quality of accommodation selected. It will normally be 4 star for the Standard option. The Superior package offers superior 4 star rooms, if available. The rate will be quoted per person, based on 2 people sharing a double room. Single accommodation or an extra night (night 5) in Stellenbosch can be arranged at additional cost. A minimum of 2 people per group. The rate is linked to the quality of accommodation selected. It will normally be 4 star for the Standard option. The Superior package offers superior 4 star rooms and 5 star accommodation, if available. The rate will be quoted per person, based on 2 people sharing a double room. Single accommodation or an extra night (night 7) in Stellenbosch can be arranged at additional cost. A minimum of 2 people per group. A presentation about what nature has to offer. Transport to the guest house/hotel of the first evening and from end of trail. Lunches, dinners, drinks with meals (Lunch packs must be ordered at your guest house for the following day). Entrance fees at Nature Reserves. The 4 day route : Day 1 – Arrival, Day 2 – Easy, Day 3 – Challenging, Day 4 – Moderate. Daily from beginning of October to end of April (high season). The route is also available during low season and may be at a reduced rate. Please contact us for details. Low season is a popular time for the locals in the mountains because of the cooler temperatures, although the weather is less predictable. Early reservation ensure that the best accommodation can be obtained. 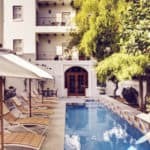 Somerset West is 35 km from Cape Town airport. Private transfers available on request – please ask for rates. Sturdy walking boots and walking socks (with a change of socks in day bag), day bag, swimming costume, 1 x water bottle with 1 litre capacity, insect repellent, sun glasses, sun hat, sun block/cream, rainproof, fleece, compass, torch and a first-aid kit. We recommend that you arrange appropriate holiday insurance covering you against illness, injury, and loss or damage to luggage. This insurance should also cover the possibility of you having to cancel your holiday for whatever reason. 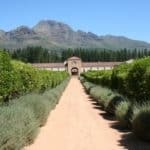 You will walk across or visit award-winning wine estates famous for their wine and unique offerings.